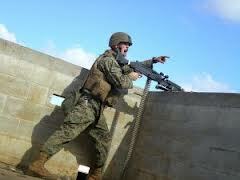 Matthew joined the United States Marine Corps on September 6, 2005. He served in the infantry as a Sniper Scout. On June 24, 2009, he was on patrol in Now Zad, Helmand Province (also known as “Pakistani Alley”) in Afghanistan called Operation Enduring Freedom. He was severely wounded by an improvised explosive device (IED). Matthew was taken to a hospital in Landstuhl, Germany. He was taken to Bethesda Naval Hospital in Maryland for intensive surgery. On July 10, 2009 he succumbed to an aggressive infection after surgery. Matthew became the 131st military member with ties to Oregon to die as a result of serving in Iraq and Afghanistan. He was the second Oregonian to die in Afghanistan in 2009. During an August meeting of VFW Post 3452, past Commander Dale Potts made a motion to change the name of the post hall from Patriot Hall to Cpl Matthew R. Lembke Hall. The vote was unanimous. A dedication ceremony for the new hall and grand opening of the new post was held on August 26, 2009. Over 150 individuals came for the ceremony. On July 24th, 2009 Pres. Obama makes a speech at the Marine Barracks in Washington. He tells Cpl. Matthew Lembke’s story and talks about what it means to be a Marine and their strong brotherhood. 1 Pings/Trackbacks for "Cpl. Matthew Lembke"